Here I am hitting the backyard before temps drop too low. This week I find myself out back with a Joya de Nicaragua Cinco Decadas paired with a Goose Island Bourbon County Brand Vanilla Stout. 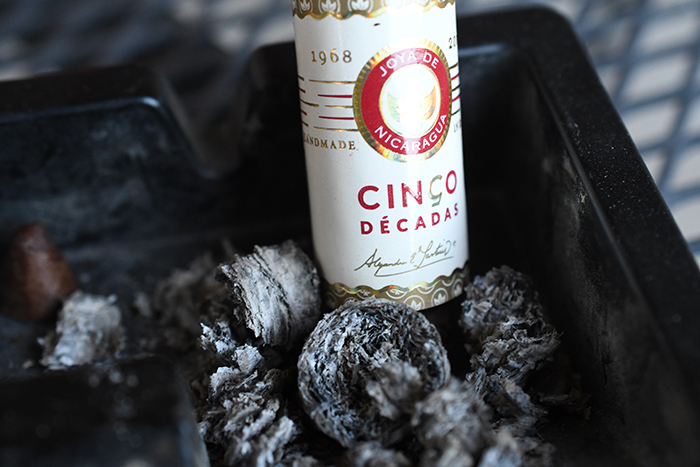 The Joya de Nicaragua Cinco Decadas translates to five decades and celebrating anything that has lasted 50 years is incredible, much less something that has faced consistent turmoil such as cigars. 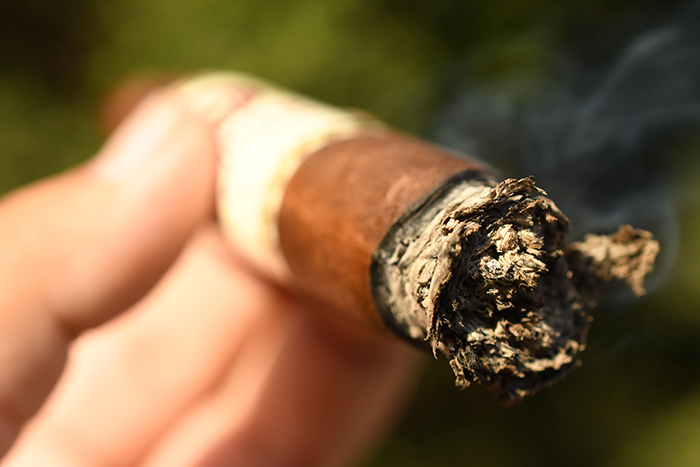 There isn’t much detail about the cigar outside of it being created to obviously celebrate Nicaragua’s oldest cigar factory’s anniversary. The cigar is offered in two sizes: The Diadema (6 x 54) and the General (7 x 50) each come packed in boxes of 10 and come in at $18.99 and $19.99 a stick with a total of 5,000 boxes being produced. Big thanks goes out to Joya de Nicaragua for sending a few of these our way to review. The Joya de Nicaragua Cinco Decadas starts out with a gorgeous dark brown wrapper with shades of orange scattered through the bottle half of the cigar and a darker shade of brown scattered around the top. The wrapper’s texture is very gritty and toothy with a small amount of oils as well as some decent sized veins running through the cigar’s body. 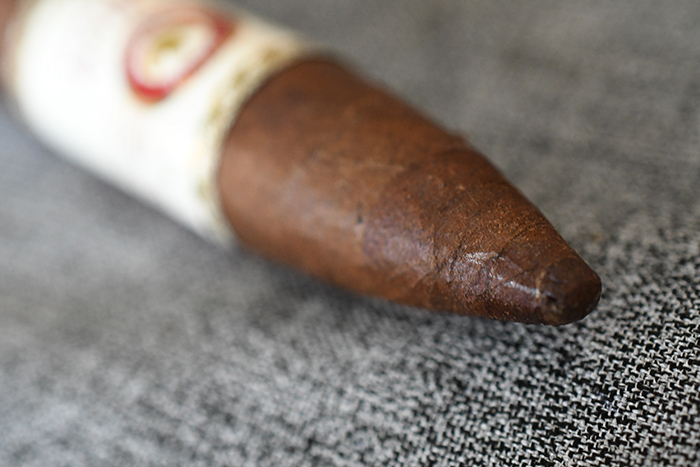 The standout characteristic of this cigar is obvious the unique diedema format in which both ends are tapered like a torpedo. You don’t really see too many cigars shaped like his anymore. 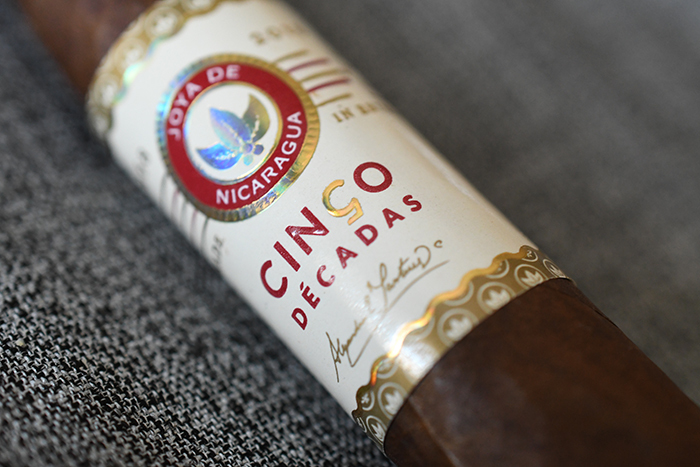 The Cinco Decadas is then polished off with an absolutely stunning manilla, maroon, and gold embossed band showcasing the Joya de Nicaragua badge as well as the Cinco Decadas logo. 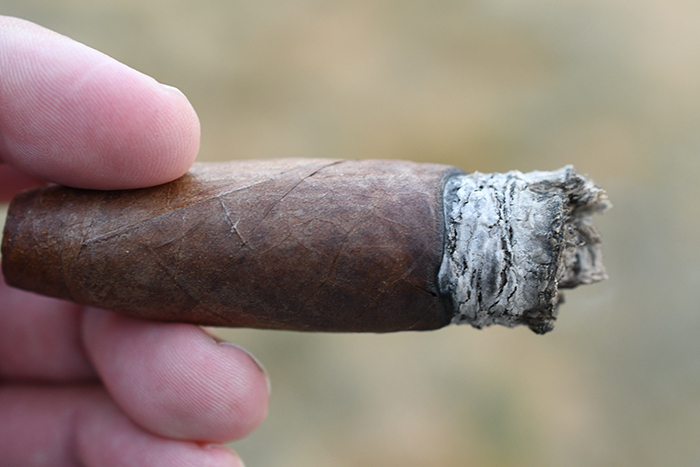 The cigar is very firm to the touch as the wrapper feels very dense and hard. 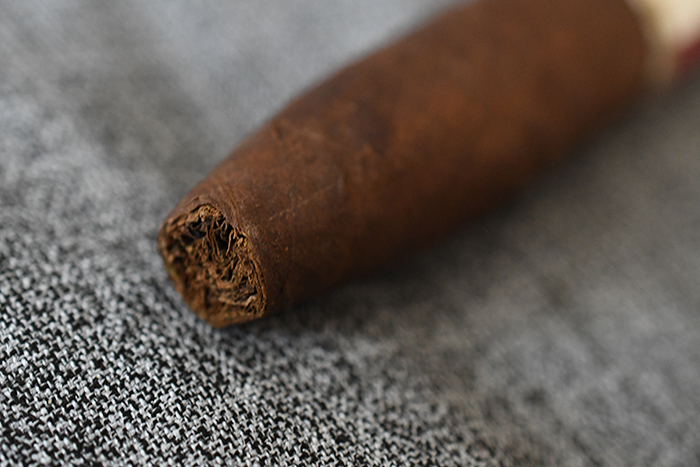 The wrapper gives off some light spice and tobacco aromas while the foot of the cigar is much more pepper driven with lots of spice and earthy aromas. The cap cut clean and easily using my Xikar XO double bladed cutter. The cold draw produces a very earthy and musky mixture of flavors with just a bit of pepper tossed on top. 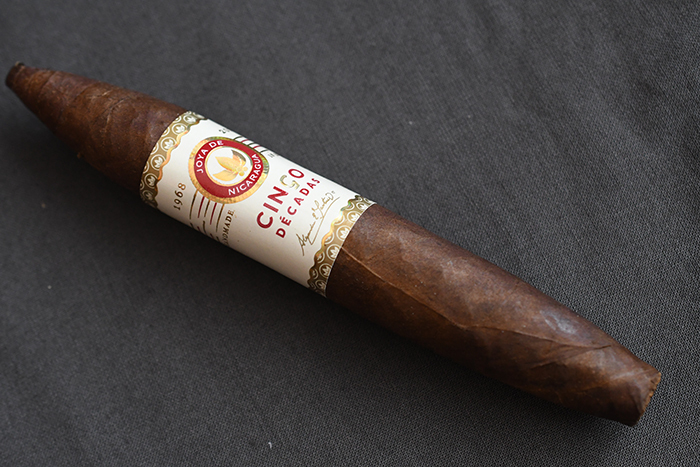 The Joya de Nicaragua Cinco Decades starts out with a very potent black pepper blast which hangs around for a considerable amount of time before fading out revealing a bold mixture of leather, vanilla, earthiness, oak, plum, and caramel. The draw is just amazing as each, tiny, little puff kicks out a massive cloud of thick gray smoke which hangs around for a considerable amount of time before dissipating while the cigar gives off a good amount of stationary smoke as it rests in my ashtray. The burn line is razor thin and dead even leaving behind a trail of medium gray ash which I thought was pretty well compacted until it fell in my lap about a quarter of an inch in. Hence the following picture not really falling my standard. Into the second third of The Joya de Nicaragua Cinco Decadas and the spice is really started to come out backed by oak, vanilla, leather, and earthiness. This is a great mixture of flavors. The retrohale focuses more on the spice and oak. The cigar is still burning flawlessly as I have taken a bit more precaution for the loose ash. I close out the second third with nothing in terms of a nicotine kick. Into the final third of The Joya de Nicaragua Cinco Decadas and this is where the cigar really starts to pour it on. Loads of vanilla, moss, oak, earthiness and leather of some light caramel, coffee and spice. It took me two and a quarter hours to take this cigar down to the nub and I experienced no harshness nor extended heat. It’s crazy how slow this cigar burned. I close out with only a very minor bit of nicotine. What a fantastic cigar. Not even going to try to hide how much I enjoyed it. 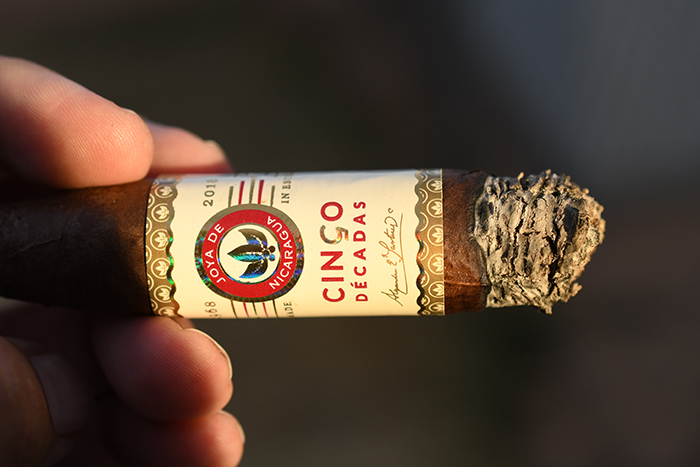 Usually Joya de Nicaragua cigars are packed with both power and punch, but I found the Cinco Decadas was the perfect balance of full flavor without being an overly strong cigar. I kept finding myself really relaxing and taking in all the flavors the cigar had to offer. While this cigar is limited, and pricey, its a perfect cigar for a seasoned smoker who is looking for a special experience. The price would be the only thing keeping this out of my day to day rotation. Its Bourbon County Time of the year! This time I chose my favorite variant the Vanilla to pair with The Joya de Nicaragua Cinco Decadas. This imperial stout is brewed in Chicago, aged in bourbon barrels with vanilla added, and comes in at a rockin’ 14.9% ABV. The beer leads with a ton of sweet vanilla, malt, caramel, cocoa, and bourbon with a very heavy/sticky mouthfeel before finishing even sweeter with more vanilla and cocoa, bourbon, and malt. As the beer warms the vanilla comes out even more. This is a fantastic beer for anyone who likes big stouts, vanilla, or barrel aged beer. The vanilla and caramel really attracted me to this beer when thinking of a pairing for the Cinco Decadas. 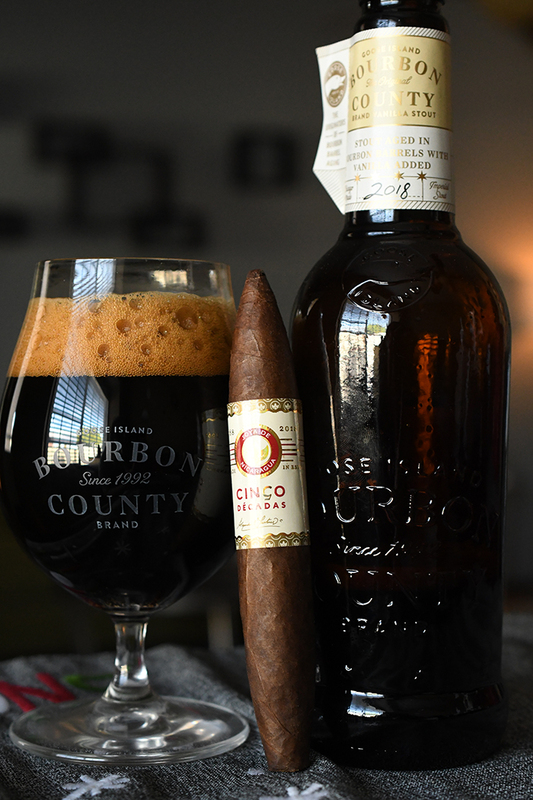 I was a bit skeptical that the beer may over power the cigar but the Cinco Decadas really held its own and it made for just a fantastic pairing experience.